Up, down, left and right — pending home sales made big leaps in February across all major U.S. regions. 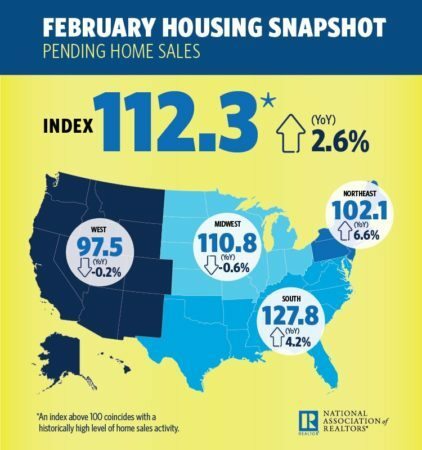 The National Association of Realtors Pending Home Sales Index, based on contract signings, sprung forward to 112.3 in February, up 5.5 percent from January’s 106.4. To what can we attribute the boost? NAR chief economist Lawrence Yun says that an unusually warm February may have triggered an early spring buying season. In other words, home shoppers were ready to get out of hibernation in their own house and into another! Northeast: PHSI increased 3.4 percent to 102.1 in February, 6.6 percent above a year ago. Midwest: PHSI increased 11.4 percent to 110.8 in February, 0.6 percent lower than February 2016. South: PHSI increased 4.3 percent to 127.8 in February, up 4.2 percent year over year. West: PHSI increased 3.1 percent in February to 97.5, 0.2 percent higher than the same time last year. “Looking ahead to the busy spring months, Yun expects to see continued ebbs and flows in activity as new supply struggles to replace listings that are going under contract at a very quick pace. This is especially the case at the lower- and mid-market price ranges, where choices are minimal and prices are being bid higher by multiple offers,” NAR noted in its PHSI report.